Luxurious 0.60cts fully channel set diamond eternity ring, created in 18ct White Gold, finger size L.
From our Ready-to-Wear collection, this exquisite full Diamond Eternity Ring has been precision set with 0.60cts of G colour VS1 Clarity Brilliant cut Diamonds. Crafted in 18ct White Gold, each 1.5mm Diamond has been channel set into the 3.5mm court shaped band which benefits from a comfort fit. This particular ring from our collection is available for immediate delivery in size L (approx. US size 6) and will arrive beautifully boxed and delivered by secure courier to your door. 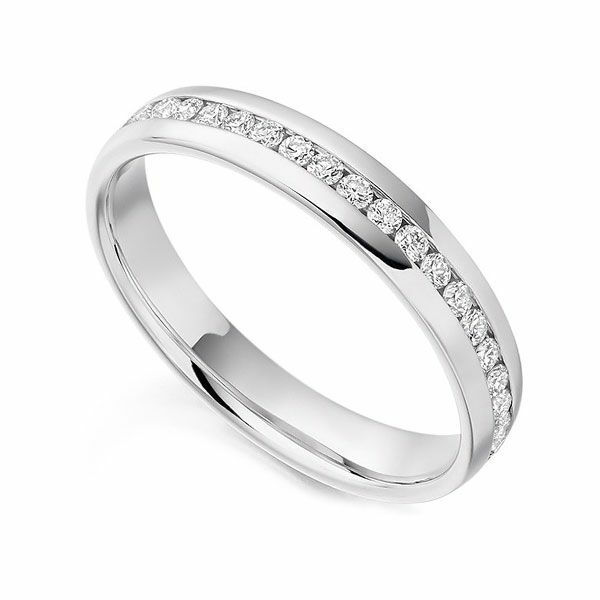 Actual photograph of the ready-to-wear full diamond eternity ring shown within the ring box. All items are sent out under plain wrapping by secure courier, fully insured for your peace of mind.